Charles Stankievech’s visual and sound installation, The Soniferous Æther of The Land Beyond The Land Beyond, currently on view at City Hall Art Gallery in Ottawa, was produced during the artist’s residency at the northernmost human settlement on the planet: the Canadian Forces Station (CFS) Alert in Ellesmere Island, Nunavut. Composed of black-and-white single images, digitally recorded and transferred to 35mm film, the work is imbued with an eerie aesthetic of early science fiction films and accompanied by a melodic and machinic musical score. Despite this science fiction feel, however, the scenes do not depict fabricated sets, but images shot on site at the active military surveillance station. 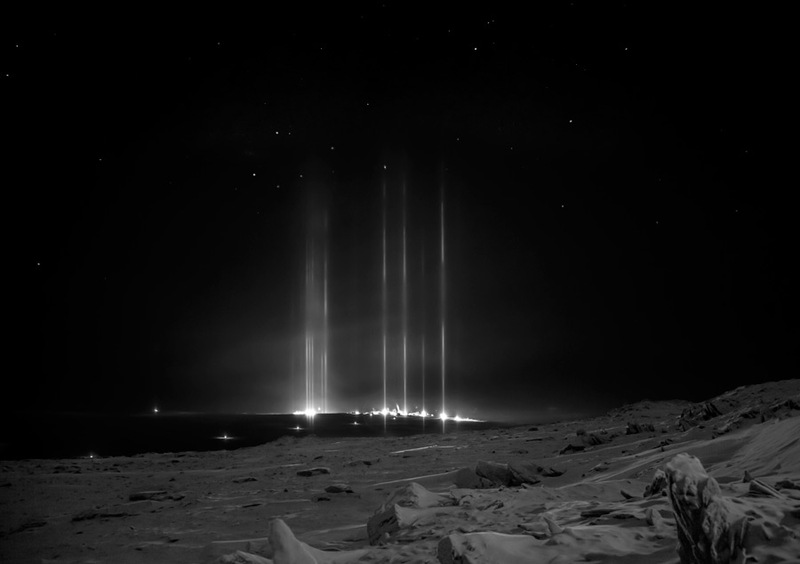 The film’s unsettling aesthetic is a result of the encountered environment and the artist’s process of production: long exposure and time-lapse photography, produced under the cover of 24 hour darkness, animate the still images with unexpected articulations of light, time and motion. At City Hall Art Gallery, The Soniferous Æther is exhibited in a darkened room with the only light source being that generated by the projector. The film opens with the bright blinking of a beacon signaling in the night. The pulsing signal is paired with a soundtrack of shortwave recordings: distant and difficult to decipher numerical sequences and an echoed beeping reminiscent of Morse code. As the beacon fades from view, the staticky sounds of cryptic communication give way to an industrial and mournful musical composition that overtakes the space and subsumes the spectator in surround sound. The following sequence of images evokes an enigmatic environment, at once earthly and extraterrestrial. 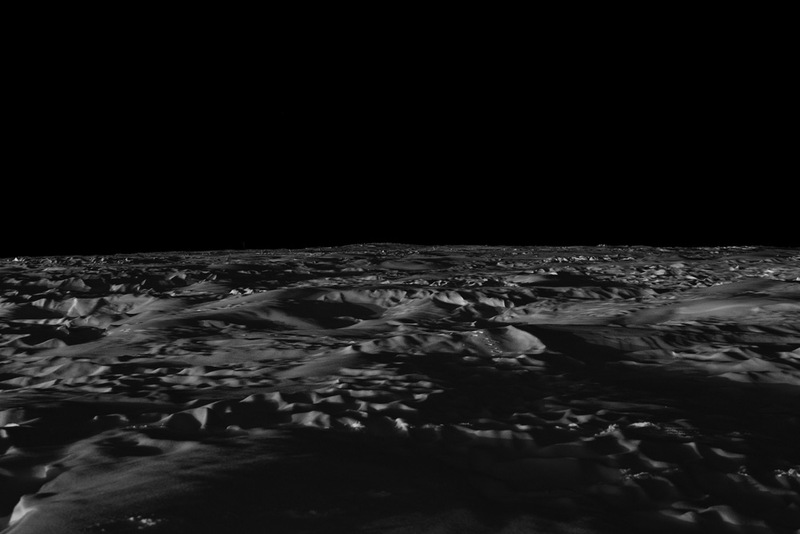 Depictions of the area’s topography display an icy expanse so unfamiliar and otherworldly that it might as well be the moon. A dome-like sky, scattered with stars, at times dwarfs the landscape with its black and borderless breadth. As the artist said in a recent CBC interview, this is an environment in which outer space seems to come right down to the ground. Further scenes picture the architecture, equipment and unpeopled interiors of the station. The distant view of buildings with light glowing in the windows and a shot of steam suddenly and sporadically shooting out of chimneys suggest a form of sustained human presence, despite the environment’s unnerving emptiness. Or, more sinister still, perhaps the people are all gone, outlived only by their apparatuses. Regardless, this is a spectral space shrouding secrets and haunted by catastrophe. In one scene, we think we see corpses left lying on a pair of stretchers, but they are just bundles of supplies covered in canvas or tarp. We are searching for clues, as the camera appears to be doing. There is in fact a forensic feeling to the investigatory eye of the camera, methodically and meticulously surveying the space. Initially occupying a more aerial position, before narrowing in on smaller details, the camera itself becomes, in an odd way, the film’s protagonist. In a eulogistic essay on the dualistic personality of Walter Benjamin as author and scribe, explorer and archivist, Susan Sontag wrote, “One never really understands a book unless one copies it… as one never understands a landscape from an airplane, but only by walking through it” (“Under the Sign of Saturn,” 124). 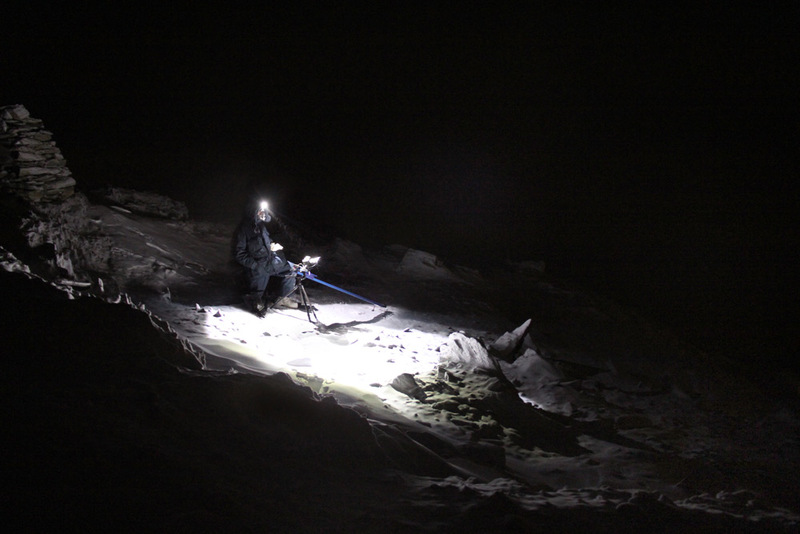 The Soniferous Æther of The Land Beyond The Land Beyond is the latest in Stankievech’s series of “fieldworks” produced at remote outposts and isolated arctic environments to which the artist travels and becomes entirely immersed. 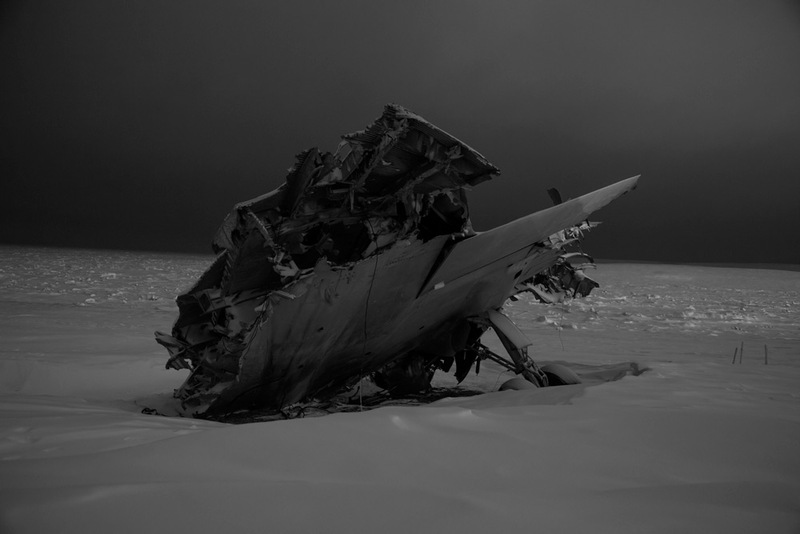 Through such intimate engagement and the similar embodiment of multiple identities – an accomplished artist, archivist, adventurer and interpreter of images and information – Stankievech produces work that both poetically politicizes fantasies of final frontiers and demonstratively demystifies the enigma of the North. The Soniferous Æther draws together reality and fiction, anachronism and futurism, in the production of a haunting and beautiful audio-visual installation. When the exhibition opened at City Hall Gallery a couple of weeks ago, we travelled to Ottawa from different points of departure, taking trains, plains and automobiles to see the show and interview the artist. The Soniferous Æther of The Land Beyond The Land Beyond is not to be missed and we are extremely grateful to have had the opportunity to discuss it at length with the artist. We couldn’t be more pleased to present Passenger Art’s exclusive interview with Sobey award nominated, internationally renowned and preposterously prolific artist Charles Stankievech. Passenger Art: Your most recent work, The Soniferous Æther of The Land Beyond The Land Beyond, is currently on view at City Hall Art Gallery in Ottawa. What is the origin of the title? INUIT NUNANGATA UNGATA is the official motto of CFS ALERT which roughly translates from Inuktitut as “the land beyond the land of the people”. The duality of this title half fiction and half military heraldry was key to establishing the hybrid nature of the work. PA: It would be easy to describe The Soniferous Æther of The Land Beyond The Land Beyond as a science fiction film. 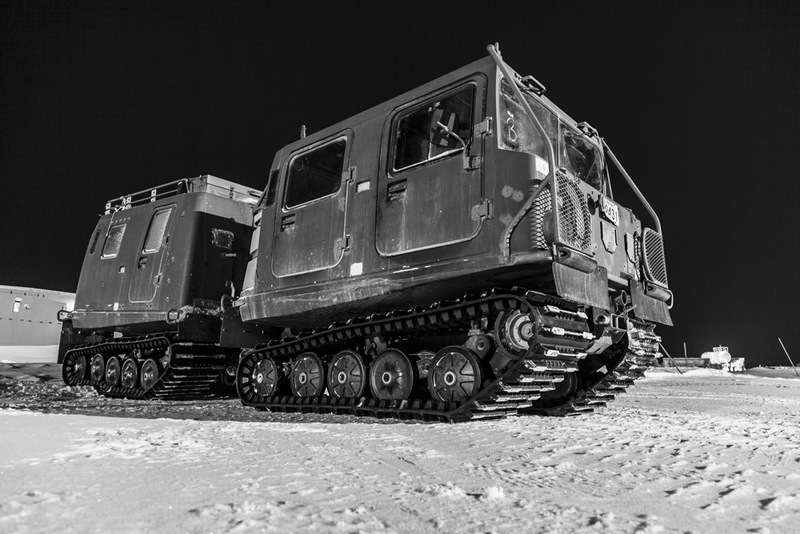 In an interview with curator Ola Wlusek, however, you suggested that because it consists of direct recordings of real sights and sounds – each encountered at the Canadian Forces Station Alert in Nunavut – its elements are more documentary than fiction. There is and has long been a connection between military or scientific reportage and science fiction fantasy. We are thinking here, for example, of the repeated claims that NASA enlisted Stanley Kubrick to cinematically orchestrate the first moon landings. What can you say about this connection and how might it be relevant to your work? CS: Kubrick’s films were an inspiration in so many ways during the production of The Soniferous Æther (TSA)—and not only formally in such things as architectural delineation through camera movement. I would also admit his anti-establishment ethos is something I share. I think if you really look past the spectacle of Kubrick you sense in his body of work a deep distrust for the consolidation and abuse of power. Dr. Strangelove is the most obvious critique of such military power, but 2001 subtly critiques IBM both in their historic role during WW2 and the future role of machines; even The Shining is about the genocide of the Native American Indians by colonisers. So I find it strange people posit that he all of a sudden was involved in some clandestine project with the US military because he used the same custom built lens in Barry Lyndon that were developed for NASA. But there are other important connections between photography and the military that Paul Virilio of course outlines in his book War and Cinema. 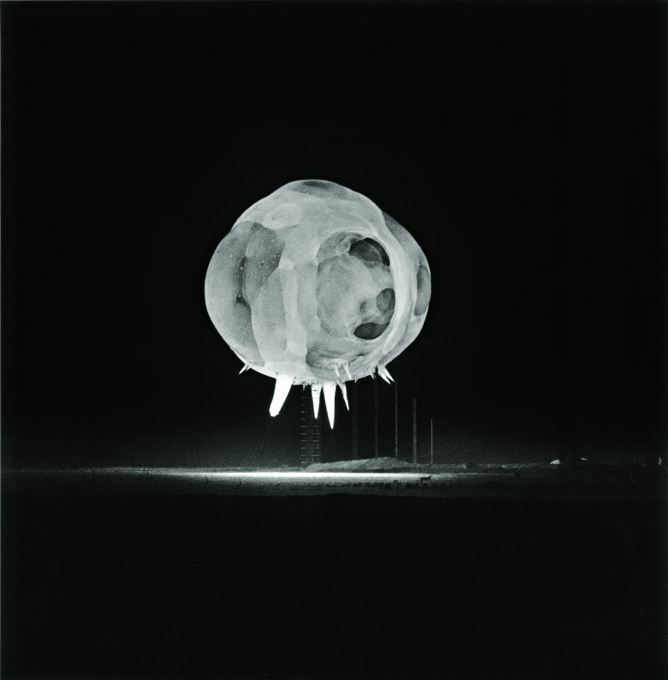 For me personally, I’ve always been fascinated by the work of Harold Doc Edgerton (think first photo of milk splash), whose crowning achievement was developing the timing mechanism to photograph some of the first nuclear explosions in the 1940s. His images are not only a poetic shift from his first use of strobe light to develop high-speed photography to the capturing of nuclear light, the images themselves look otherworldly despite being objective documentation, like galactic planets or microbes. PA: The film’s soundtrack is made up of sound bites from spy stations and your own clandestine recordings within the space, but there is also a melodic element that implies a musical composition. You have included music and other sounds in much of your earlier work as well. Presumably, it is of paramount importance in an Arctic winter when sight is so limited. Can you discuss the significance of sound for your artistic production? CS: My graduate work was a systematic research plan that looked at the intersection of sound and architecture—essentially how space shapes sound and inversely how sound shapes space, everything from headphones to concert halls, 4D sound sculpture to the sonic properties of felt (on show now at the AGA). It was an important body of work for me to really understand how space functions as well as providing an oblique critique of a visually dominated culture. During this time, I was really fortunate to work with R. Murray Schafer and Alvin Lucier who are really the two legends in this field, the first for defining the concept of the “soundscape” and the second as THE conceptual composer of space and sound properties. Combined with being a DJ in undergrad, I’ve always considered sound as important as image when it comes to art. I can say however, I’ve moved a little away from pure fieldrecordings to include more melodic music in the last couple of projects, most notably in collaborating with Tim Hecker for LOVELAND (which you [Reilley] have written a lovely essay about). I really appreciated the emotive element that Tim brought to LOVELAND, and I felt it necessary to compose a melodic element for TSA to stitch together the haunting electromagnetic recordings with the sublime images of the site. It also allowed me to incorporate Glenn Gould’s 1950s recording of the Goldberg Variations, which fit a film about a northern location created in the 1950s. I mixed the composition I made based on a sample from his recording as if it starts to emanate once inside the station, as if some officer’s record was stuck on a loop in a distant room seeping down the hallway. In this way I’m imagining a parallel between Gould leaving the performance venue of the concert hall in favour of the recording studio, much like the officers secluded away in the arctic station recording the æther. It helps of course to know about Glenn Gould’s seminal radio documentary from 1967 “The Idea of North” for the state operated Canadian Broadcasting Corporation, and I’m not making crazy connections between composers and encryption. George Antheil along with Hedy Lamarr invented the concept of frequency hopping, so for me this musical ritonelle functions much like the number station loops in the first half of the soundtrack. Number stations also are often identified by a little music loop before numbers are recited. In TSA the decaying piano loop finds its echo again in the loop of the film’s narrative structure and material properties. The sound eventually transgresses the diegetic space to overwhelm the image once we exit the architecture and leave the station via the Romantic images of the plane wreck and Albert Speer-like Cathedral of Light created by the atmospheric weather surrounding the station. For this reason it allows me to not only flush the space of the gallery with sound and try to formally bridge the gap between virtual and real worlds, but also make this bridge via an emotive connection, as Deleuze and Guattari write: “sound invades us, impels us, drags us, transpierces us. It takes leave of the earth, as much in order to drop us into a black hole as to open us up to a cosmos. It makes us want to die.” Finally, radio static impresses upon the listener the idea of nostalgia through representational or indexical means, but a haunting melodic loop does it through direct mimesis. Kubrick’s The Shining again was really important here as a forerunner, not only as haunted memory through music but the idea of producing the virtuality of memory through looped repetition. PA: In the same decade as Gould’s CBC broadcast, French speleologist Michel Siffre spent two months completely isolated in the utter darkness of a subterranean cave without sight of the sun or any access to clocks and calendars. He has argued that, in such a situation, terrestrial temporality becomes incomprehensible or irrelevant and that one experiences time as a single ceaseless day (or night). During the time you spent at CFS Alert, you were similarly plunged into 24 hour darkness in the absence of what you describe as the “cyclical and circadian rhythms” that we are used to. Can you describe the effects of such privation on perception? CS: Well for me, my experience was considerably different. I’ve talked before about the very weird moment of first waking up in the morning where you open your eyes after being asleep and you realise that if I don’t switch on an artificial light, I won’t see anything for months if I was to stay at the station until Spring. Of course, waking up in the middle of the winter in a lot of countries could give you the same sense, but it seemed much more real in this place, where after a couple weeks I’d not seen the light of day. I should say however I was ultra aware of time since I was there shooting timelapse photography with 5 hour long sequences composed of thousands of 1min long exposures. I’ve probably never been so conscious of time, but it definitely was based, on the one hand, on striated time such as the clock. TSA makes a pointed edit with a long take on two clocks each running simultaneously under different types of power, AC and DC, so this type of manufactured and measured time was extremely important. Also, since I was embedded in a military operation, there are few things like the clockwork of the military schedule. Lastly, the darkness I experienced was quite the opposite of being locked in a cave. I probably was in one of the most open spaces in the world, and I could still see the stars. In fact the movement of the stars creates a pivotal sense of time in the work. If you watch the work closely, throughout the piece the stars are all moving the same direction creating their own rotational movement, which is not the circadian cycle we are used to, but it does echo the looping structure of the film that endlessly loops in the gallery. For me TSA is “the zone” between the static and the changing, like a needle stuck in a record groove, so time is important. Shall we say The Soniferous Æther generates post-apocalyptic time? Not Classical circular time, not linear Christian eschatological time, something beyond both, a dialectic of the two where time feels out of joint after a singular rupture. PA: That’s an interesting suggestion. In fact, (as Reilley has discussed in relation to LOVELAND), there is a sort of circularity and ceaselessness to (post)apocalyptic time, as the apocalyptic event is never just an ending, but also the initiation of a new beginning. It is both a rupture and a return and we constantly construct narratives to keep this revolution in process. James Berger has likened the temporality of apocalyptic anticipation to the inverse experience of trauma – often described as the psychological embodiment of looping, repetition and eternal return. Rather than mere existence after the end, Post-apocalyptic would thus signify a state of suspension between past and potential disaster. By extension, apocalyptic discourse would always be both “post” and prophetic. There is an aesthetic of abandonment or aftermath in The Soniferous Æther, and while people aren’t present in any of the images, life is implied by their architecture and ongoing operational activity. The interplay between the images and soundscape, the slowness generated by the timelapse process, and the scenes themselves – empty interiors, clinical corridors, and the depiction of ruins and wreckage – give the film a memorial quality. The spectre of death saturates a number of scenes. Do you see The Soniferous Æther as a post-apocalyptic film? CS: I think TSA lays out something a little different, and I’d like to keep a distinction between apocalyptic and post-apocalyptic time. So yes, I would say TSA is a post-apocalyptic film. I haven’t read Berger but I think there is a problem with the idea that anticipation can relate to trauma—for me this remains in the Christian understanding of the eschatological. For me –by its very nature– real Trauma is that which cannot be defined and is a radical cut in the symbolic system which structures one’s reality. The loop or the compulsion to repeat occurs after the trauma simply because it does not fit within an accepted understanding. The loop occurs not because we project a future potential trauma, but rather because the trauma echoes again and again not caused by the repetition of the original trauma but because we still are unable to incorporate this trauma and communicate it to others; this is a second trauma: not as event, but as failure. Sonically, this is expressed in TSA with the melodic refrain and the tape delay which creates a strong reverb and echo that eventually washes out into darkness—the fatigue of a psychotic episode only to be triggered again by a flashing pulse attempting to reach out. LOVELAND I think fits possibly more in an Apocalyptic framework as you [Reilley] have previously written about, because the Event is visualized. For me LOVELAND sublimates the event of the trauma through a nebulous beauty and subsequent repetition, but it is key that we never witness the trauma that transpired in TSA. A dark unknown is at the centre of the piece. I don’t allude to what the traumatic Event was, and I don’t feel there is any life at the station, rather there are only machines that remain running with an undead drive, possibly rendering a communications outpost mute and unable to transmit its own rupture. Hence why I shot the film in complete darkness using a time-lapse technique, as an expressionistic gesture. With TSA I don’t show anything; I only circle at the pace of the cosmic around the dark centre of a real world classified military operation and thus attempt to define the trauma by delimiting its perimeter like the event horizon of a black hole. PA: Your film makes evident the fact that the architecture and ideology of the cold war still occupies the Arctic. Would you argue that the Cold War is in fact a continuing conflict rather than a historical event that has come to a close? Is that perhaps what is implied by your concept of the “warm war”? CS: Well yes and no. It’s true that most of the mechanisms in the Arctic established in the Cold War are still operational. Since I produced my Distant Early Warning Project in 2009 which first established this idea of the Warm War and the connection between environmental concerns and national defense, people consistently talk to me about the shut down of the DEW Line and the environmental cleanup after the fact of the sites. But there is a consistent misunderstanding; the DEW Line wasn’t shut down, it was upgraded to more powerful stations that have a longer range and thus the amount of stations were reduced and automated. The system of an electromagnetic curtain across North America’s Arctic still exists, reinforced by satellite surveillance. In fact military operations in the North are increasing as the daily newspapers are starting to report pretty regularly in the last few years. There isn’t an Arctic nation that has not increased military presence and spending in this theatre. Aside from the playfulness of the term Warm War referring to a connection with Global Warming as a cause for the potential conflict, it refers to the direct theatre of conflict of the Arctic. The Cold War was partly called “cold” because it supposedly avoided direct “hot” conflict on sovereign territory instead playing out warring ideologies in third party zones like Korea, Vietnam, Afghanistan, etc. The Warm War is that place in between The Cold War and a Hot War; this time around the Canadian Arctic is not a zone of mediation, or an “anti-environment” as Marshall McLuhan once called it, it is the zone of contestation itself. It’s a shift from what we once thought was a No Man’s Land into a Nomad’s Land, a phrase I use to talk about the shift in our understanding of the history of the Arctic from an empty colonial terra incognita to recognition of the nomadic cultures that have lived in this region for thousands of years. In the context of the Warm War, it is also referring to the active military maneuvers, which are becoming more present in the final opening of the historically elusive Northwest Passage. PA: Zeroing in on a specific scene of the film, one of the images depicts a bowling alley in the station and at the end of the lanes, just above the pins, a pair of painted eyes flank the word “ALERT.” It is a conceptually captivating image and we were struck by the twofold meaning of the word “alert,” referring both to a warning and to the state of being watchful or actively perceptive. Would you say that this same double meaning encapsulates the essence or function of the station? PA: In addition to lunar and lucid vision, a surveillance station is predicated on a system of watching and being watched. The scene with the eyes on alert seems to be strategically emblematic of this visual architecture. Would you agree? CS: It’s an interesting pareidolic reading of the scene. Usually I think I’m the paranoid one, but I guess not in this case. My collaborator Anna-Sophie Springer always saw that face when we were editing too. I was more concerned with invisible electromagnetic surveillance that is at the station so I wasn’t thinking of this type of visualization, but it’s a nice reading you have: that the watchers are being symbolically watched in their leisure time. For me the bowling alley scene functions much like the classical narrative technique in medias res: that you can walk into the gallery at any time in the film loop and enter the frozen temporality. There is no narrative despite their being a carefully calculated montage, instead each long take (and this one most effectively) creates the feeling the station was abandoned upon a crisis like that classic 1964 NFB film Skidoo 23 or the 1972 Christian film A Thief in the Night. The bowling pins in disarray, the score sheets on the table, the balls ready to be thrown. We have the wreck of the plan outside that is an ancient ruin and on the inside a preserved leisure activity (which also to be honest has its own period aesthetic). This counterpoint I find very effective. PA: The wide range of references from which you draw inspiration attest to the fact that throughout your career, you have proved an avid archivist. Evident in both your writing and artistic output, you seem to be a constant collector of objects and ideas. Your previous projects have often been accompanied by books that function as both catalogues and artworks in themselves and you are even a co-founder of the independent publishing company, K. Verlag | Press. Is there a reason that you did not produce a book for The Soniferous Æther of The Land Beyond The Land Beyond? Is it possible that the archival impulse or element was satisfied by the transference of your footage to 35mm film and the medium’s commonly perceived archival character? CS: TSA is part of a series of work, which includes ice water from the station in an editioned lacrimosa, an editioned redacted postcard sent from the station, the act of burying a meteorite at the site, and photographs. There is the plan to make a book (beyond the initial catalogue published by the Ottawa City Hall gallery) that includes archival material such as facsimiles of the colour plates from the doctor’s journal from the HMS ALERT arctic exploration ship which gives CFS ALERT its namesake and which I archived with the Air Force Museum Curator while she was visiting the station to look at their historic artifact holdings. The book is in production still. PA: We look forward to its eventual publication. So, if it was not intended to fulfill an archival imperative, why did you choose to transfer your digital footage to 35mm film? CS: I choose to exhibit the work on 35mm for some complicated issues having to do with protecting the secrecy of some images. It also became important for me in designing the exhibition that the visitor first enter the gallery and see the projector running in a well lit room, only after this and hearing a signal beacon pulsing in the distance is the visitor drawn down a dark hallway into a completely black space, where the film starts to play. TSA is about our fantasies of the North and military outposts, and it was important to balance the sublimely Romantic images in the black box of the projection space with the white cube of the art gallery where you could see the “engine” running loudly and producing the projection of the fantasy. For this reason, it echoes the generator I purposely placed in the film, which shows the power source of the outpost. The 35mm film projector is the generator of the installation and the materiality and physical presence of the machine becomes important to understanding the work’s symbolism. PA: As a final question, what in the name of Christmas is the Canadian Forces Artists Program? It is apparently through this organization that you secured your residency at CFS Alert. While it is well documented that militarism and art have a long and shared history, there is always something a little disconcerting about the alignment of arts and arms. Although it is certainly not the case in your work, the fear is that instead of the army’s support of the arts, the result becomes art in the service of war. Can it ever really be a marriage of equals when one bedfellow is so heavily weaponized? CS: Walter Benjamin has actually been a guiding voice for me ever since my early writing on Carl Schmidt’s political theory and Leni Riefenstahl’s films. I think particularly the Epilogue to his famous Mechanical Reproduction essay comes to mind when thinking about cinema and war. I try to balance what I can glean from the Futurists with someone like him. I also think its very important to point out, while I was “embedded” or in residence with the Dept of National Defense, I was not paid by them nor do they have any ownership of the work or control over it in anyway. I was only given access to a site based on a proposal which I only said I was going for research purposes, which actually turned into a problem. The Military police rejected the majority of my gear I wanted to take on the project and I really had to think on my feet to produce the work I did—literally in the week before going I had to readjust my whole plan strategy to security issues. I even scared the Operations, who I won’t say who said it, but they literally responded to my preliminary research questions with: “I thought this was an artistic endeavour”. I should also make it clear, while the History Directorate were supportive, Operations was not happy I was present and did not help me at all—of course they were cordial. I had to think outside the box to get this work made. But unlike the worst mix of pop culture and propaganda in a film like Zero Dark Thirty, I wasn’t required by the CIA to rewrite the script and I didn’t have to negotiate like other Hollywood films my script and final edit for use of their assets. It’s a humble film. I realize my audience is smaller as a result, but I think we are realizing that guerrilla warfare is a contender in contemporary times and Empires always crumble. Power is not only in weapons, it is also in information as we’ve learned in the last few decades, but as we’ve known since the war on Troy, it is also in imagination. PA: Touché. That’s a fantastic answer. We can’t thank you enough for taking the time. This has been a great conversation. This entry was posted in Uncategorized and tagged 35mm Film, Alvin Lucier, Arctic Sovereignty, Canadian Forces, Charles Stankievech, Cold War, Contemporary art, Darkness, Deleuze and Guattari, Glenn Gould, Harold Doc Edgerton, Installation Art, Looped Time, LOVELAND, Michel Siffre, Military Surveillance, Post-Apocalyptic, R. Murray Schafer, Science Fiction Film, Sound Art, Stanley Kubrick, The North, The Soniferous Æther of The Land Beyond The Land Beyond, Thomas Pynchon, Tim Hecker, Time, Time-lapse Photography. Bookmark the permalink. Hi, thanks for reading! we appreciate it and any comments or questions about our posts.